Genetic programming (GP) is based on genetic algorithms (GA). GA uses the theory of evolution (Darwin, et al) and manipulates data to do best-solution search, learning, and inference. GA starts from a group of individual creatures (or substantial sets of data). Each individual has its own adaptation level. The level differs. Those individuals do reproduction (or recombination) and create next generation descendants. During reproduction, those with higher adaptation level have higher probability of survival than those with lower adaptation level - like "survival of the fittest". GA model should have both GTYPE (gene-type) and PTYPE (pheno-type). GTYPE is basically gene and PTYPE is each creature's resulting characteristics and behavioral patterns based on GTYPE. As the generation (t, t+1, t+2...) goes forward, the overall adaptation level of the group will improve (become well fitter to the environment). For reproduction, partial gene-exchange (crossover) and mutation (random change of some part of gene, in some rare cases) are used for computational operation. If GA/GP is properly modeled, this could be used in various areas - for simulations, and even evolution engines. When compiled & executed, it prints its source code exactly. Self-reproduction is an attractive theme for many computer scientists and rogrammers. Create the first egg program which can create another program and execute it. Then encrypt the object code and put it as a character string into a mother program. A mother program creates a new program by decrypting the character string. .... "Chicken & egg" process continues…. Then we may use random numbers for mutation. That s an interesting first post, Takushi. Although it must be complicated for mere mortals. But I do think that genetic algorithms are interesting. Do you think that we will be one day, able to create a program that begins with , say a black box like in cell automata and produce human beings ultimately? oh by the way, i ve made a mistake. It s not genetic algorithm, it s generic algorithm. I meant "genetic" - not "generic". Sorry. So I corrected typo. I also modified the C program example part in HTML (in Edit mode) so that the long line can properly fit in the screen. I added a Japanese translation upfront. I also added intra-post references (jumps) by directly editing HTML so that readers can jump back and forth between Japanese and English. 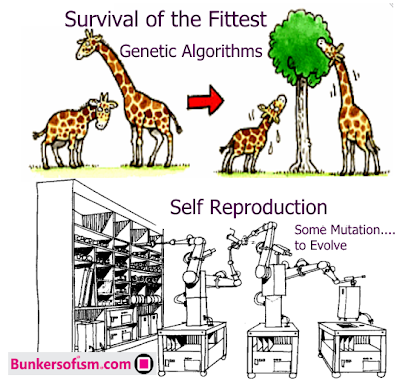 so do you know a practical application for genetic algorithms? And also, the question is: if you rely on self-reproduction, can you reach highly complex AI? More than 20 years ago, I wrote a LISP program which modified itself during execution because LISP treated code and data in the same way. In the OOP (Object Oriented Programming) languages, this is practically very difficult. It is easy to create a Java program using an encrypted string of other Java program (.class file after compilation) and reproduce that program and execute it. But this is far from the goal. We may need a new programming language - to support genetic programming & self reproduction. what about starting creating that new programming language right now? For the new language, I would like to take good features from LISP, Java, Pascal, Perl, and maybe C++. Good things of LISP is that it treats code & data in the same way so that the program can mutate during execution. Good things about Pascal is that it distinguishes functions & procedures and allows the user to organize those in hierarchical scopes. Perl has built-in hash, sort, pattern atching/replacement/value-extraction for text strings, etc. I still heavily use Perl to quickly write programs with substantial complexity. The only language i enjoyed a little bit is perl by the way. Why? Because of its flexibility and its nonchalance.